Do I Need to Get a New BD Client? Just come from twitter where somebody at BeamDog advised somebody who had just bought EE, that if they were using the BD launcher and wanted to access the toolset they just needed to select "Launch Aurora". Seeing as such an option doesn't exist in the version of the BD launcher that I've got, do I need to somehow (I thought it was supposed to let you know there was a new one available) get a new version or were they getting ahead of reality? No, you don't need a new version. The order is still the same. The Aurora Toolset works exactly as it did in the original Neverwinter Nights. 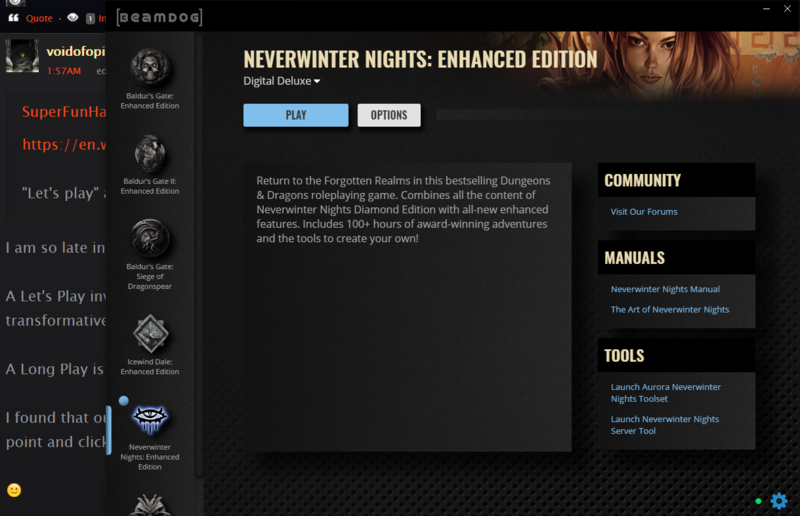 You should be able to access the toolset from the Beamdog Client by clicking Options and choosing open game location. After, go to the bin/win32 directory and run toolset .exe. I will investigate about that tweet. Edit: Here is a pic of the resized launcher. Mind you, didn't affect me that much as I've made a shortcut to the toolset when I first got it back in November. So noticed under Manuals, there is an art book to download. So I did. Since I haven't missed a stream I have to ask - Did I miss the announcement about these options on the right side of the launcher? Because they weren't there back in November. If not why weren't they. Especially that art book. I know someone who would have made use of it already (not me, I have all the artistic talent of an arthritic brick). The art book was released with the collectors edition of Neverwinter Nights back in 2002. It probably wasn't an option until NWN:EE was officially released. (my guess). But you are right I never heard of the announcement and it isn't listed in what is included with the game. @JuliusBorisov maybe @TrentOster or @PhillipDaigle should show these things in the next stream? A number of people I've talked to who were also early adopters didn't know about them.